Get Hillsboro Monument Works, Inc. in Hillsboro Texas, to create classic bevel cemetery markers. 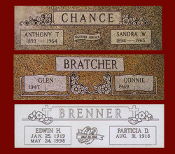 Our attractive headstone designs are ideal for marking your loved one’s resting place. Bevel Markers are taller at the back than they are at the front, and are more visible and are less prone to accumulating soil and dirt. Choose from a wide range of designs and colors available. Our most popular design is the 24” × 12” gray granite marker. The price is determined by the type of stone used and the cemetery fees required. The Slant Marker is an alternative for an upright. You can read it as you walk to it. It is thicker at the bottom than at the top for stability.